In a pan, whisk the cream and all the other ingredients up to and including the egg yolks, bring to just below the boil on a medium heat, stirring constantly. As soon as the mixture thickens, remove the pan from the heat. Stir in the chocolate, melt, pour the crème through a sieve into a bowl, leave to cool. Stir the crème until smooth. Beat the cream with the sugar until stiff. Beat the egg whites with the salt until stiff, carefully fold into the crème with the whipped cream, place in the bowls. Cover and refrigerate for approx. 1 hr. Put the glaze in a small bowl. Dip the physalis up to half way into the glaze, allow the excess to drip off, allow to dry on baking paper. 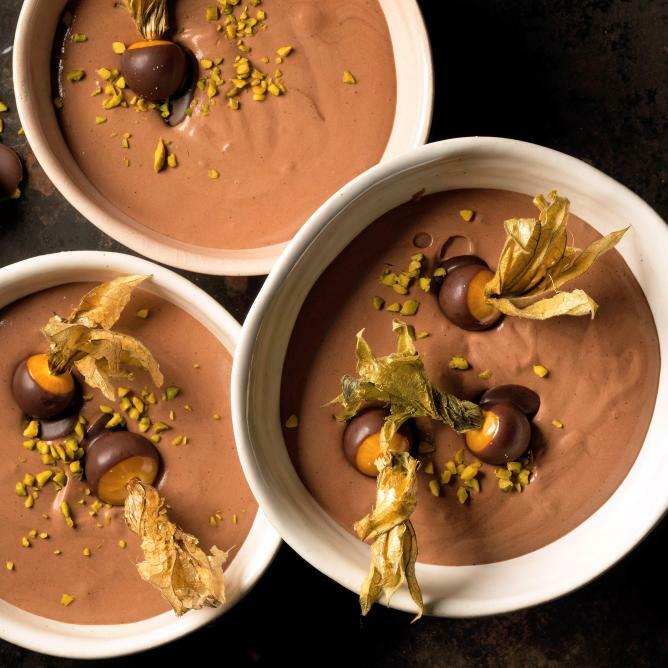 Serve the chocolate crème with the physalis, scatter over the pistachios.